Regiment/Catrawd: Royal Flying Corps, Royal Air Force, 108 Squadron. Missing presumed killed, 27th September 1918. Arthur Saunders Jones was the son of Reverend William Jones, and his wife Mary Ellen. He was the brother of Ivor Dryhurst Jones, who has his own page on this website. He was born on the 30th May, 1899, and baptised on the 3rd July of that year. He is described in Find My Past Powys baptisms as the son of William and Mary Ellen Jones, of The Vicarage, Llanfair Caereinion. The family details for the 1891, 1901, and 1911 censuses are the same as for his brother Ivor, who was just one year older (b. 1898). The website Soldiers who Died in the Great War confirms the above details for Arthur. His service records can be found on Find My Past, British Royal Air Force Officers Service Records. They give the following information (Ref 79/759). 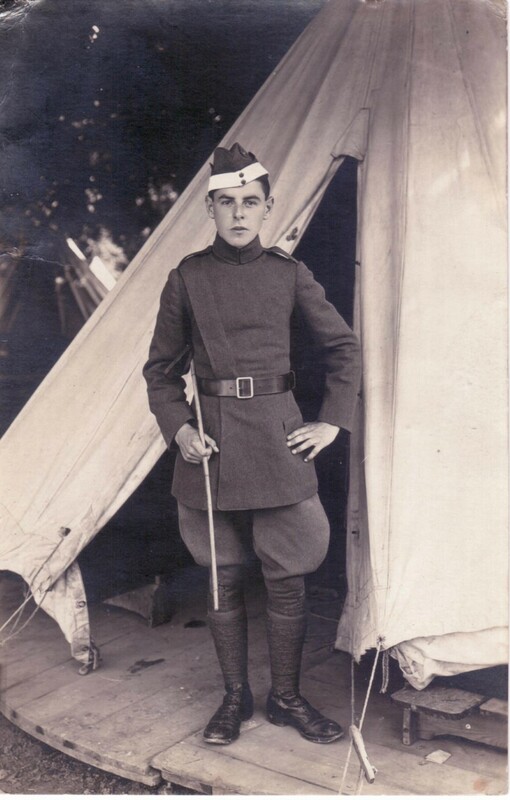 Arthur’s attestation was on June 6th 1917, a few days after his 18th birthday. His service number was 83414 in the Royal Flying Corps. His corps trade was an aviator, his next of kin was his mother, Mrs M.E. Jones, and his occupation was a bank clerk. He enlisted for the duration of the war. It was noted on an undated Army form that he was discharged owing to “his services being no longer required, as he had been appointed to a temporary commission as a 2nd lieutenant (on probation) on the general list for duty with the RFC” authorised by W.O. letter. By November 11th 1917 he was at the Recruits Depot, Farnborough. The Royal Air Force Museum website gives details of a pilot’s training at this time. A trainee pilot would spend 2 months in a cadet wing, then 2 months in a school of Military Aeronautics, followed by a 3 months 1st course at a Training Dept Station. Next came 2months 2nd course at a Training Depot Station, then the cadet would be given their wings, if all courses had been successfully completed. After this followed specialist schools before active flying service. Our airman Arthur’s records show that his Officer cadet wing was at Winchester (2OCW). He was then at Oxford, possibly Port Meadow Aerodrome which was used for RFC training. His next stage was completed at 31 Training Squadron RAF Wyton, which is near St. Ives, Cornwall. He was at Lake Down Training Depot Station in August 1918, which was one of five such depots and was in the Stonehenge area, and were built to supply pilots for the front line. On August 21st he completed the course for overseas at High Lake. He was gazetted to 2nd Lieutenant (probationary) in May 1918, and to 2nd Lieutenant (acting) in August 1918. The next entry on this form is that he was reported missing on 27th September 1918, while serving with 108 squadron. We do not know when he went overseas, but he could not have been there long. Later, “death was accepted for official purposes as having occurred on 27 9/18”and his total period of service was regarded as 155 days. The Royal Flying Corps was the air arm of the British Army before and during WW1 before it merged with the Royal Naval Air Service on April1st 1918 to form the Royal Air Force. 108 Squadron, to which Arthur belonged at the time of his death, was originally a squadron of the RFC. It had been formed at Stonehenge in November 1917. Their motto was “viribus contractis” or “with gathered strength.” Their badge was an oak leaf, which was adopted as a sign of both strength and age. In July 1918 the squadron went to Capelle, Dunkirk, armed with Airco D H 9 bombers, for day bombing against targets in north west Belgium. In October 1918 it moved to Bissenghem Belgium, and remained there until the Armistice. During its service overseas the Squadron made 59 successful bombing raids, 40 reconnaissance flights, 2 photographic flights, dropped approximately 70 tons of bombs, and shot down 9 enemy aircraft (a further 29 were reported shot down but were not confirmed). With the outbreak of the First World War in August 1914, it was clear that the Royal Flying Corps would have to expand if it were to serve the Army in France and replace its own casualties. New training units were opened, and civilian flying schools were commandeered. The quality of the instructors varied however, and many of the aircraft used were unsuitable. Accidents were common, and for most of the War, casualties at training units were greater than losses in action. When the Royal Air Force was formed in April 1918, it inherited over 100 Training Squadrons and 30 specialist schools. By the Armistice in November, pilots were receiving instruction on an eleven months course, which included an average of 50 hours solo flying. It was just six weeks before the Armistice, on September 27th, that Arthur, newly arrived in France, set out on his last flight. His aircraft was a DH9 (De Havilland), serial number E669. The name of the “other occupant of the machine”, details from the RAF Story Vault website, was Serjeant Alfred Richardson. Both were 18 years old. They were reported missing. It was not until December 8th 1919 that death was officially accepted as having occurred on or since that day. 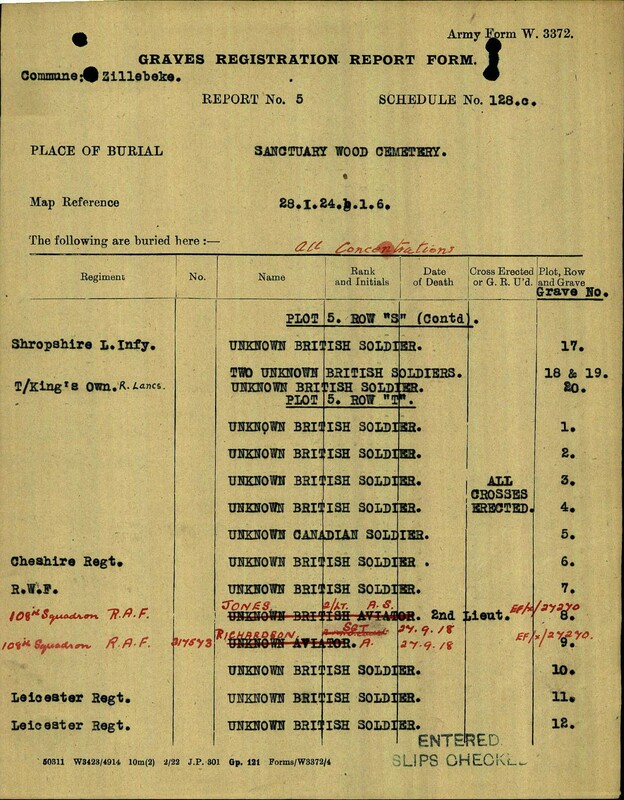 On the back of Arthur’s Casualty Card it is stated that he was buried in grave 560, in Lichtervelde German Military Cemetery. However, the CWGC website shows that both Arthur and his companion Alfred Richardson were buried in adjacent graves in Sanctuary Wood Cemetery. The previous cemetery records show that the words “unknown British aviator 2nd Lt. RAF 108 Sqdn” and also “unknown aviator RAF 108 Sqdn” were crossed out, and Arthur and Alfred’s names are written above in red ink. There are no dates given for any of these events, so since they were previously missing for so long, it seems likely that they were identified , and presumably re-interred, over a considerable period of time. Arthur was the second son lost to his mother, Mrs Mary Ellen Jones, in just over a year. Like his brother Ivor, he is also commemorated on the site naming sons and daughters of the Anglican clergy, who lost their lives during the war. He is also commemorated on Boy Soldiers Killed In Belgium, by Paul Fossa. In the archives at Hawarden, Mrs ME Jones signed a card on September 25th 1919. She adds the comment ‘Missing September 27th 1918. Bombing over German lines, near Courtrai’. Photo of Arthur courtesy of Elizabeth Ann.